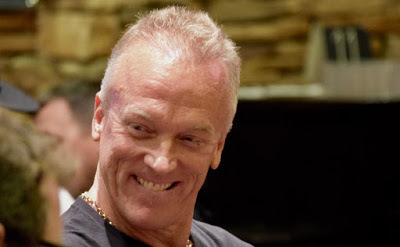 In very typical-for-him style, Pat @FlyinLyons re-enters and moves all in his very first hand back. First-to-act at Table 8, Lyons put his entire brand-new 30,000 stack in action, folds all around to the blinds where Paul McCaffrey says he has his favorite hand but can't call. George Saca is next up in the BB, Saca flashes Norman Chad's favorite Ace_Of_Spades and mucks. Lyons claims he had King_Queen.